This new space in the Riviera Nayarit was opened to encourage community development through art, culture and education. The first phase of the Soriana del Mar Community Center in the Nuevo Corral del Risco in Punta de Mita, Riviera Nayarit, was inaugurated on Friday, February 10, 2017. Lisa Schalla and Greg Stanton, executive director and president of the Punta de Mita Foundation (FPM) Council, respectively, presided over the ceremony. Also present were José Gómez, the mayor of Bahía de Banderas; Lourdes Ibarra Chiquete, head of Culture, Sports and Education; plus a number of representatives of the Soriana and Comunalia Foundation (Alliance of Community Foundations of Mexico). Local parents, children and teens, were present to witness the ceremony, as they will be the main beneficiaries of finished project. The first phase will include bathrooms, a kitchen and a multi-purpose room; the second phase will prepare the outdoor gardens and spaces with a roofed stage as well as offices for the FPM. Construction should be done by the end of Summer 2017 if the donations continue to come in as they have until now, as they finally have a major donor. 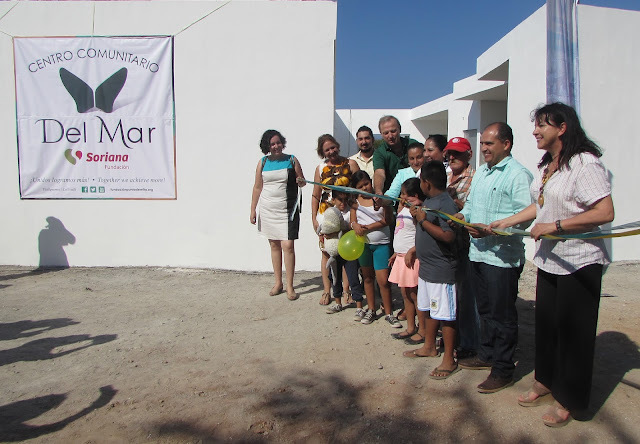 One of the most immediate steps to be taken is the creation of a committee from among the residents of Punta de Mita so they themselves can define the priorities to be worked on in the workshops and other activities in the new community center. When on the topic of community centers in the Riviera Nayarit and the entire region, one always comes to mind—San Pancho’s Entre Amigos—for the extraordinary work they’ve accomplished for over 10 years, which is why the Punta de Mita Foundation has been and always will be advised by Nicole Swedlow and her team.